Just in from Healeys. Eddy B called to tell me Kenny Neal was a last-minute special guest at Jeff Healey's regular Thursday gig. He was in town because his daughter had a CD launch at the club the night before so they asked him to sit in with them. Dave Murphy was probably the previously scheduled guest and he did a stand-up job backing up Kenny and when he sang a couple of tunes in the next set, he rocked. So as I'm watching this go down, I'm trying to analyze what makes this work. When you're a "special guest" like this, there's no rehearsal, no charts...you're lucky if the key get's announced. So the seasoned veterans would not pull out an original tune that no-one has heard (which is what I've often done). No, they play the most obvious blues standards they can think of. Two that Kenny did, Bad Sign and Big Boss Man, are tunes that I could pull out and play, except anytime I've tried somebody would groan "I can't possible play that song one more time" Well I'm going to run over those two and maybe a couple more standards and have them ready for the day that I'm invited to come up and do a couple of tunes. Kenny pulled it off great - his whole set was predictable, easy to follow-along songs (there was even a sing-a-long song). He's a great performer - I learned a lot watching him. When he wanted the band to come down in volume, he looked back to Al (Webster, the drummer) and then bent down a bit to signal that the volume was about to drop. The Al gave the snare a little snap - I love that!. Al is an amazing drummer - so relaxed. Alec Fraser was playing bass - a rock - and there was a fiddler doing a blues tune when I came in. A young guy...I want to meet him. Apparently he plays with Jefff healey's Jazz Wizards. I also heard of a great fiddler who plays with Grand Bouche. I'm going to get me a fiddler that wail the blues and we could have a real high-energy duo. Last night I went to hear African superstar Baaba Maal. That was amazing. The stage was laid out beautifully and the lighting just right. There was lots of dancing (even some Senegales audience members climbed up and did that Senegalese two-step. The vocals were the thing, with backing from two percussionists and 3 acoustic guitarists and one playing the "Senegalese guitar" ..a simply strung instrument with maybe 3 strings. He was a true virtyuoso on that instrumen. One of the guitarists, the one who was sitting down at the back of the stage, turns out to be a legend himself...and mentor to Baaba Maal. He played great. I'm going to try to come up with a tune that uses that afro-groove. Yes...I'm still here wrriting songs when I should be wrapping up my album. Well, no regrets - the thrill of coming up with a good tune is amazing...even if the tune is eventually discarded, at that moment of creating, it's cloud nine. Good Friday! This was a first for me. I've played in churches before but never as part of the religious service. But the good folks at St. Timothy's Anglican Church wanted to integrate some blues into their Good Friday service an I got the call. I just went up to Itunes and dialed up Rev Gary Davis, listened to the short samples of many of his blues/gospel tunes and found a few that I knew instinctively, though I hardly remember ever playing them. It was a very moving service, with the readings from the bible interspressed with short "tableaus" of scenes from the Passion of Christ and my bluesy tunes. I wish I had let the audience know ahead of time that they were welcome to sing and clap - but alas, no one did. Last week, they were talking about the passing of Mitchell Sharpe, a very influential minister in the time of Pierre Trudeau. Many reports related his passion for classical music and I was remembering playing a gig at "The Bay" department store - I think it was with Terry Wilkins on bass and Carrie Chesnutt on sax. We were jammin' away at the foot of the escalator, right by the shoe department, and there was this older gentleman sitting off to the side taking in a large part of our set, and then he showed up again later. Terry though he was Roland Mitchener, former Governor General, but when the gent came up to say thanks for the music, we realized it was Mitchell Sharpe himself - and now we know that he was a blues-lover, too. My friend R who works at the Canada Council, dispensing grants mostly to classical musicians but spreading it around a little more, recently, came to town with his guitar and recorded a demo of some great new songs - right in my kitchen. We got Paul to come over with his Neumann mic and his big ears and we got a great sound. I'm sure those songs are going to travel well and I hope he can give them a good shot even though he's got a very demanding day gig. And I think I've noticed that it's harder to be accepted as an artist if you're working behind the scenes in the music industry, though I'm sure there are exceptions. The music scene is not much of a support system, even for those that work in it - some would say they "eat their young", even. After the recording session, we headed out to hear Lance Anderson & Mike Sloski's gig at the Dollar. Not a great turnout but fabulous music. Lance is a master of the organ "footwork" - ie bass pedals. Looking forward to playing with him and his full rig sometime. Nick Blagona, who recorded their album, was there and I asked him if he might have a good copy of "Dont Forget Your Mother" the recording I made in 1973 - because he was the engineer on the session. Frazier Mohawk, who produced that session, thought I should dig up that old chesnutt and send it to the Radio stations for Mothers Day play. 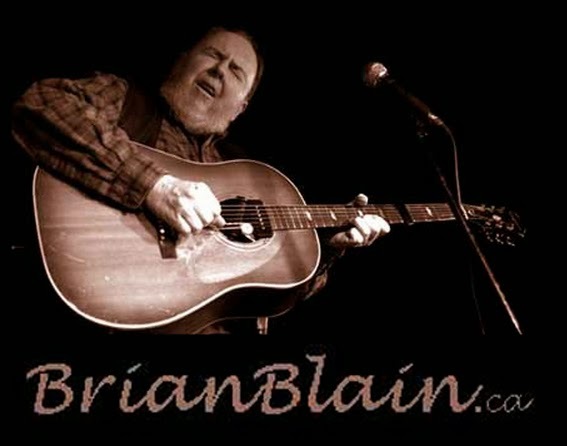 I was hoping to get a Mother's Day gig - I want to call it Brian Blain's "Don't Forget Your Mother" music and craft show. If it doesn't come through, I'm going to find a way to do this myself, some other year...Meanwhile, I'll send out a few CD's and we'll see if anybody plays that crazy track. It might even get me a little press - it's worth noting that I've recently been contacted by someone who working on a biography of world-renowned drummer Jim Gordon, who played on the session and later killed his own mother. Aplogy of the month: To the House of Blues for screwing up their listing. After they went and bought a full-page ad in MapleBlues for the Blues Tour at Hummingbird Centre, I listed it as Massey Hall. What was I thinking? Now I'm never going to get on the list for that show!